Roses are not nearly as hard to grow as the reputation tries to say. They do especially well under the natural organic program. Here are those I like the best. Dortmund - red climber. Large, single red blooms are recurrent and blooms overlap each other, giving the impression of a delicate ruffle. With a white eye set off by brilliant yellow stamens, the flowers are dramatic. The foliage is equally impressive with its large, glossy, dark green leaves. The thorns are showy with their reddish hue on new growth. 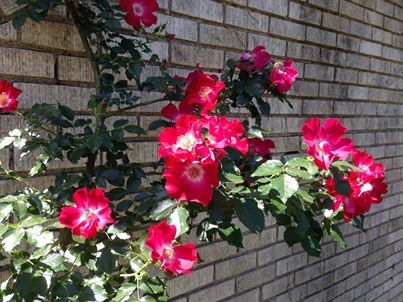 Plant this climber in a location where its vigorous canes won’t intrude into walkways. Belinda's Dream - pink shrub. Cross between Tiffany and Jersey Beauty. Fast growing, upright and sturdy, few disease problems, bluish-green foliage. Flowers are throughout the growing season with a rich, distinctive fragrance. Cinco de Mayo - Rust red & smoky lavender floribunda bush. Very unique color with various shades of red, orange and purple clusters of blooms with none to mild apple fragrance. Medium sized flowers in small clusters in flushes throughout the season. Medium sized, glossy, dark green foliage. Height of 35" to 47". Ducher - white bush. The only white China rose. It blooms a soft ivory-white. Buds are round and often have a hint of pink on the outer petals. Typical bronzy new growth but the mature foliage is uncharacteristically light green. Home Run - red bush. Superior resistance to both black spot and powdery mildew, and an almost continuous supply of brilliant red, single blooms. It is an offspring of the original Knock Out but has a more compact, rounded habit. It’s an own-root rose. Julia Child - yellow bush. Medium-sized golden flowers produced in clusters that repeat all season. The small round bush has foliage that is bright green and glossy. Grows 26" to 31" with a spread of 26" but larger in warm climates. The bright green foliage makes a nice backdrop for the buttery yellow flowers that don’t fade like other yellow roses. Katy Road Pink - pink bush. Griffith Buck rose introduced in 1977. 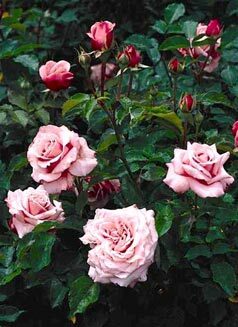 It was through a plant exchange with Conard Pyle Nurseries in 2001 that the Antique Rose Emporium discovered that "Katy Road Pink" was in fact 'Carefree Beauty.' Forming an open, but extremely graceful bush, it has few insect or disease problems and is not particular about soil or growing conditions. It is free blooming, probably one of the most floriferous pink roses with new buds appearing all the time. Grows 3’-5’ tall by 4’-5’ wide with large hips in the fall. La Marne - pink bush. 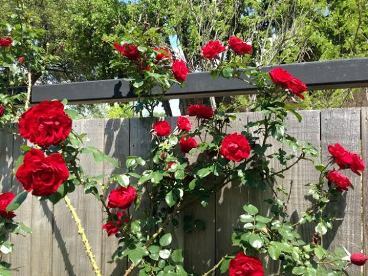 Neat, erect and heavily covered with healthy, shiny leaves making this rose an excellent hedge plant. Flowers are borne in loose clusters of open pink and white cups that are showy and attractive at close range or at a distance. They re-bloom heavily especially when in open, sunny areas. 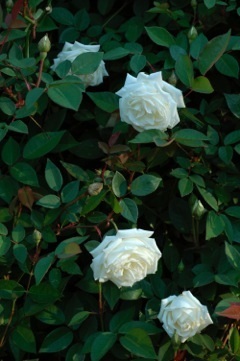 Lamarque – superb white climber. Named for General Lamarque, this rose is the result of a cross between‘Blush Noisette’ and ‘Parks’ Yellow Tea-scented China’. Vigorous climber, fragrant flowers of medium size and double in form with white petals that have a touch of lemon yellow at the base. We have had bouquets of ‘Lamarque’ on the table for Christmas Day. A superb climbing rose. Martha Gonzales - red bush. Bright scarlet, neat and single flowers open flat on a neat bushy shrub with a dark red tinge. Due to its size, it serves as an excellent choice for a low hedge or border. The Antique Rose Emporium’s original cuttings come from Navasota gardener, Martha Gonzales. It has become popular with landscapers for mass plantings and large drifts. Mrs. Dudley Cross - yellow bush. Rose often seen when wandering through older gardens. It is compact, shapely and gives even the most careless gardener a steady supply of fragrant, double, delicately-shaped yellow flowers that blush a little pink in the sun. The stems are nearly always thornless and the foliage is healthy and handsome. Mutabilis - also called Butterfly rose. Climber, leaner or big bush. Once sold as ‘Tipo Ideale’, has the typical China trait of darkening with age, instead of fading. Single petals open sulfur yellow, changing through orange to a rich pink and finally crimson. Bright, silky flowers of all these colors will often be on display at the same time, looking like a group of multi-colored butterflies. A healthy, well-branched shrub, ‘Mutabilis’ will easily grow to 6 feet or more. Showy flowers are accented by the bronze color of the new growth. Old Blush - pink bush. Also known as Common Monthly, Common Blush China, Old Pink Daily, Old Pink Monthly, and Parsons Pink China. Semi-double hybrid of R. chinensis. It has medium, semi-double, lilac pink flowers in loose clusters that flush darker pink in the sun and are followed by large orange hips. The blossoms drop quickly to make room for their successors so it is not a very good cut flower. The bush is full and upright in habit, growing slowly to over 5 feet with neat, healthy foliage. Fragrance is soft, but fruity and pleasant. Whether used as a spectacular hedge, a specimen or in a border, Old Blush should be treated simply as a flowering shrub and not fussed over. The Fairy - pink bush. Small size, abundant pink blooms and tough nature. It produces a wealth of small, double, light pink blossoms that may turn blush white during intense heat. It is very useful for small landscapes due to its size with a mature height of 3 feet and a width of 4 feet. It has a low spreading habit that is good for borders or cascading over the edge of a container.